"Happy Birthday" (even though it's not your real birthday) I really like birthdays. I just turned 2 1/2 on January 15. . I also wanted to say "Ugh" to you...just because. Just in case you forgot about me, my favorite color is green eggs and ham. My favorite game is Matchy Match on mommy's iPhone. My favorite toy is my play kitchen. My best friend is not Goliath, it's Steve from Blues Clues. I love spinning and doing twirls and practicing my "spits" (Splits - like Savannah). I'm the cutest baby my mommy knows and my daddy's "stinkin' Binkin'". I love Frosty the Snowman. My favorite thing to say is "Bah-be-ah" because no one knows what it means, not even me. When I put my flowery sunglasses on, I turn into Prince Charming from my favorite show Super Why. 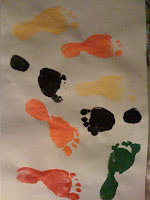 I liked painting you a picture with my feet and I would like to do it again soon.